Tony Johnson is a senior tooling engineer for mold making at Quadra Tooling & Automation, a unit of Q Holding Co. He uses finite element analysis to aid the firm in tooling and product development. “The difficulty in simulating rubber is it is a non-linear simulation,” said Tony Johnson, senior tooling engineer for mold making at Quadra Tooling & Automation, a unit of Q Holding Co. 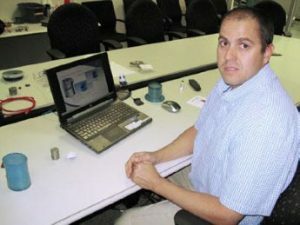 He is responsible for the mold design department at Quadra’s facility in North Canton, and he also assists in product design, working regularly with finite element analysis programs. Internally, it can help staff predict where high stresses will be during the molding process. When used properly, it can help Quadra reduce tooling costs, so the firm doesn’t have to design tooling more than once. It’s normal to do about 10-15 simulations per project, according to John Miller, Qure Medical technical support manager. “You usually improve after two, but you really don’t know unless you do a pretty wide range to find out how far you can go,” he said. “Everybody focuses on the production process, but the development process has a lot of low hanging fruit, with multiple iterations and trial and error,” he said. “It’s something we’ve seen in automotive become almost second nature. Company officials said about 10-20 percent of projects go through the simulation process. Miller said it’s all driven by technology. “We charged them, but we had the ability to do it, so we were just helping out their engineers,” something that can benefit the firm down the line, he said. Ross said familiarity will build use of the process. “As more customers see the benefit one time, they ask us to run FEA,” he said.